Nintendo wii console repair guide. Fix all common problems of your Wii console. This step by step guide helped thousands to fix their Nintendo Wii common problems themselves and saved over $100 each time per person. People who used this manual are fixing their Nintendo Wii themselves. Wii repair guide walks you through the repair process from start to finish. It is loaded with pictures, diagrams and each step is described in detail. The manual covers all the most common problems encountered. The best thing about this repair guide is that it does not require the reader to have any special technical knowledge or tools. All procedures listed can be done by anyone using common tools and supplies. 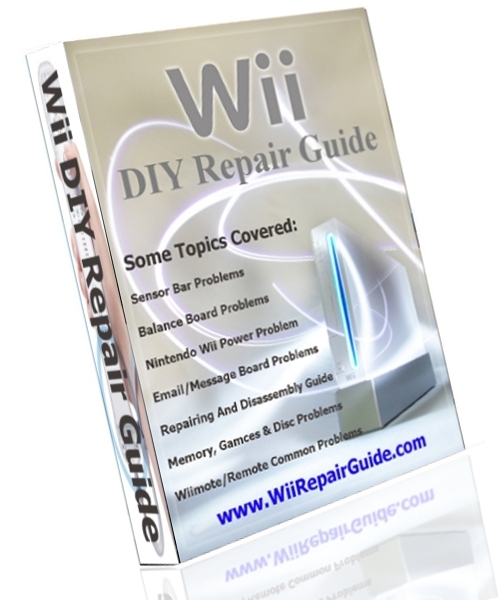 The most Powerful, Simple and Easy to Follow Nintendo Wii Repair Guide you will ever come across. Most of problems are easily solved using this instruction manual. Many customers have been helped using this repair guide all over the world. Spending less than $15 to get Nintendo Wii fixed fits a lot easily into the monthly budget than the $100 to $200 required to have it repaired by a third party each visit. With the help of this Do-It-Yourself guide you can fix nearly all of the most common problems! Here are just a few of the most common problems that this guide covers. 1. Nintendo Wii: Error message "Message Board Data is full"
2. Nintendo Wii: Warning message "Be careful about posting too many messages"
3. Nintendo Wii: How do I reply to a Memo? Why Can't I reply to a Memo? 1. Nintendo Wii: common error code list and description. 3. Nintendo Wii: Cursor is off center, jerky, erratic, or disappears etc. 4. Nintendo Wii: Remote buttons are sticky or stuck down. 11. Nintendo Wii: Message "There is no Mii save data on your Wii Remote. Format this save data?" Guide also covers the following Nintendo Wii Error Codes. Buy this guide and start playing your favorite games AGAIN TODAY!! !